Home » What's New » Surgery for Intermittent Exotropia? Intermittent Exotropia (outward eye turn) can develop at any age. When the eye is turned, it can be a cosmetic concern. Further, it can result in double vision, words moving on a page and lost of depth perception. Depth perception is the ability to judge the distance of an object, and to see in 3D (3 dimensions). It is important for driving safety, and for some occupations such as a policeman or a surgeon. Vision therapy, over the course of several months, can successfully improve both depth perception and alignment of the eyes for most patients. Strabismus (eye muscle) surgery can be performed as well. Although surgery may provide immediate cosmetic improvement, it may not improve depth perception. Below is a summary on the strabismus surgical outcomes for those with intermittent exotropia. 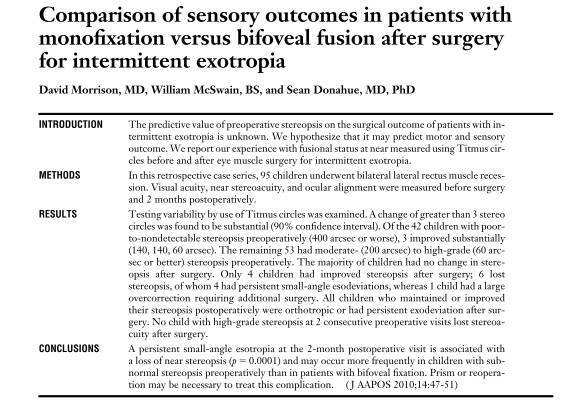 The purpose of the study was to determine if the sensory results in patients with intermittent exotropia who underwent surgery are predictable based on their pre-surgery sensory measurements. The study specifically investigates whether patients with monofixational stereoacuity or bifoveal fusion have a more significant improvement in stereoacuity post-surgery. Bifoveal fusion is defined as 60 sec of arc or better, monofixational stereoacuity is defined as 70 to 200 sec of arc, and nil stereoacuity is defined as 400 sec of arc. The post-operative stereopsis was compared to the pre-operative measurement, the potential predictive factor. Knowing the probability of improvement, clinicians can decide whether surgery is a preferable choice of treatment for their patients with intermittent exotropia. The study was a retrospective study with 95 cases of intermittent exotropes who had bilateral lateral rectus muscle resection. The population was nonrandom and included children from age 3 to 17 with a mean age of surgery of 7.5 years old. Patients with previous eye surgery, amblyopia, developmental delay, nystagmus, and cranial nerve palsy were excluded. This ensures that the patients are all similar with respect to ocular and systemic history therefore post-operative results would not be affected by other factors. Additionally, specifying the population in this way ensures they can perform the testing with relative accuracy. All patients underwent the same type of surgery, however the amount of resection depended on the maximum deviation measured with prisms on cover test at distance. Follow-up was complete as all patients had two follow-up appointments, one immediately post-surgery and one 2 months post-surgery. All 95 patients had stereoacuity and the alignment of the eyes at near and distance measured at these appointments. It is unclear whether the measurements were biased because the study was retrospective. The study did not mention where the medical records were taken from, if they were all from the same clinic, and if there were several surgeons and examiners taking measurements. The study results show that, in general, the proportion of patients who showed an improvement was not statistically significant. Furthermore, in patients with nil stereoacuity pre-operatively only 7% improved. In patients with monofixation, 19% improved. No patients with bifoveal fusion resulted in decreased stereoacuity. All patients who improved had an orthophoric or exotropic alignment post-surgery. All patients who experienced a loss in stereopsis had and esotropic or exotropic alignment post-surgery. The association of decrease in stereoacuity with esotropia is statistically significant. These results are likely because stereopsis is a skill learned by the brain when both eyes are working simultaneously. Patients who had poor stereoacuity pre-operatively have not learned how to combine the images seen by the two eyes therefore, even after surgery, the skill is not easily learned. In contrast, patients who have monofixation already have the ability to combine images therefore, after surgery, a small proportion may improve as the eyes become better aligned. Patients who have had a longstanding exotropia may also have anomalous retinal correspondence in order to achieve some binocularity. If this is the case, they may improve after surgery due to the brain’s previous knowledge of stereopsis or they may not improve as the brain cannot simply change its previous accommodations. Moreover, patients with consecutive esotropia have an opposite orientation and the brain cannot adjust easily therefore, they may lose existing stereopsis. The study measures but does not examine the post-operative alignment in the proportion of patients whose stereoacuity improved. It would be interesting to note whether improved patients also had an improvement in alignment. The study also only investigated the patients up to 2 months after surgery. We cannot conclude whether the stereoacuity remained stable, increased, or decreased long-term. Additionally, there was no mention of any type of vision therapy to help improve binocularity after surgery was done. Vision therapy post-surgery may aid in achieving stereoacuity or stabilizing the gained sensory skills. The patients in the study are similar to the population who have regular eye examinations. Additionally, the stereotest used in the study, the Titmus stereocircles, is commonly used in the clinic. The results of the study can therefore be applied easily to practice. We can suggest to patients that surgery should not be the first line of treatment for patients. Strabismus surgery should not be solely a cosmetic surgery, but it should help the eyes attain binocularity. However, this study showed that there is only a mild chance of favourable outcomes from surgery. Not to mention, on the off-chance that some improvement in stereopsis is seen, the eyes may still be misaligned. Patients who undergo surgery and result in an esotropia have a higher likelihood of losing the sensory ability that they had originally. In conclusion, this retrospective study indicates that the pre-operative stereoacuity does not predict the sensory outcome in young intermittent exotropes who undergo surgery. In fact, regardless of the pre-operative stereoacuity, only a small proportion of the population may experience an improvement in stereopsis. There is also a chance of losing stereoacuity if consecutive esotropia results from surgery. The study does not investigate whether the stereopsis gained by few remains long-term and if other treatments such as vision therapy may help if administered post-surgery.